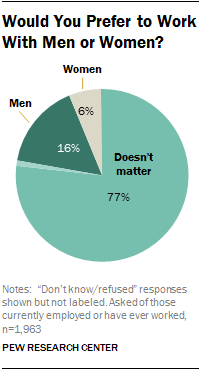 Most Americans say it doesn’t matter if their co-workers are men or women. But for those with a preference, men say they would rather work with men—and so do women, according to a recent Pew Research Center survey. About three-quarters of adults, including 78% of men and 76% of women, say it doesn’t matter to them if their co-workers are women or men. But to the remaining 22%, gender matters—and it’s men who get the nod from both sexes by about a 2-1 margin, according to the national telephone survey of 2,002 adults conducted Oct 7-27. When the results are broken down by gender, men who express a preference are twice as likely to say they would mostly prefer having other men as co-workers than women (14% vs. 7%). Women with a preference agree: About one-in-five (18%) say they would rather their co-workers be men while only 5% would mostly prefer to work with other women. Members of the Millennial generation—adults ages 18 to 32—are significantly less likely to prefer working with male coworkers than other generations. 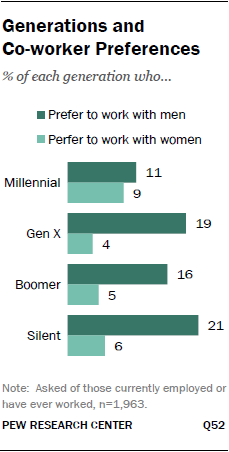 Overall, about one-in-ten (11%) of young adults say they want to work mostly with men compared with 19% of Gen Xers, 16% of Baby Boomers and 21% of the Silent generation. Adding gender to the analysis reveals other notable generational differences. Millennial men are significantly more likely than older men and Millennial women to say they prefer to work mostly with women. Overall 11% of these young men say they favor working with women compared with 5% of all non-Millennial men and 6% of Millennial women. At the same time, about one-in-five of Gen X women favor male over female co-workers (22% vs. 3%). That’s also larger than the share of Boomer men (13%) or Millennials, regardless of gender (men 11%, women 12%) who would rather work mostly with men. Women of the Silent generation (adults ages 66 and older) are more likely than Millennial men to favor male co-workers (20% vs. 11%). The sample of Silent generation men in this sample is too small to analyze. While relatively few Americans say they personally would rather work mostly with one gender, the results change significantly when the question is broadened to test what respondents believe the broader public prefers. Instead of asking their personal preference, two questions asked respondents whether, “generally speaking,” they thought the sexes preferred having men or women as co-workers. Now, about four-in-ten (44%) believe that men have a preference when it comes to the gender of their coworkers. About a third (34%) believe that women also have gender preferences in co-workers. But beyond these differences, the overall pattern of these responses is the same as when men and women are asked about their personal views–with one notable exception. When asked about male preferences, men and women agree that men prefer men as coworkers. Among male respondents, about three-in-ten (32%) say men generally prefer to work with men while only 7% say they favor women co-workers. An even larger share of women—40%–of women say men prefer men as co-workers while 9% say men would rather work with women. But the pattern changes when men are asked about women’s preferences. Now a larger share of men believes that women prefer to work with other women rather than with men (25% vs. 13%). In contrast, female respondents say that women favor male co-workers (21% say men vs. 10% say women)—a view that is accurate based on women’s actual answers.